As you’ll see, there are countless other reasons to visit Peru this fall other than celebrating the 100th anniversary since Machu Picchu was rediscovered. 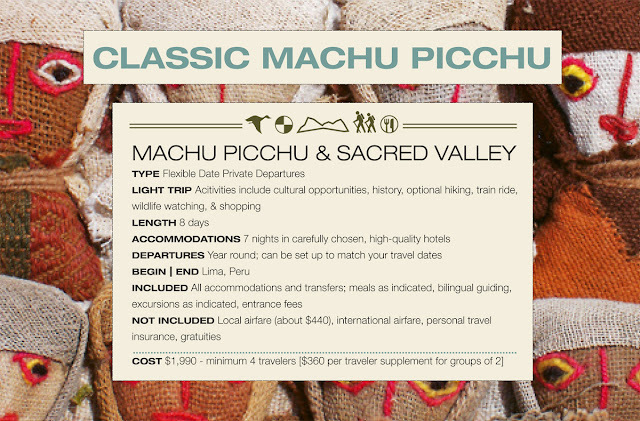 We are proudly unveiling two new Classic Knowmad trips which take you to Peru’s highlights as well venturing off the beaten path to little-known lands: Classic Machu Picchu and Peru Active Explorer. Day 1 – Arrive Lima. Depending on time, visit the city’s sites, museums and restaurants. 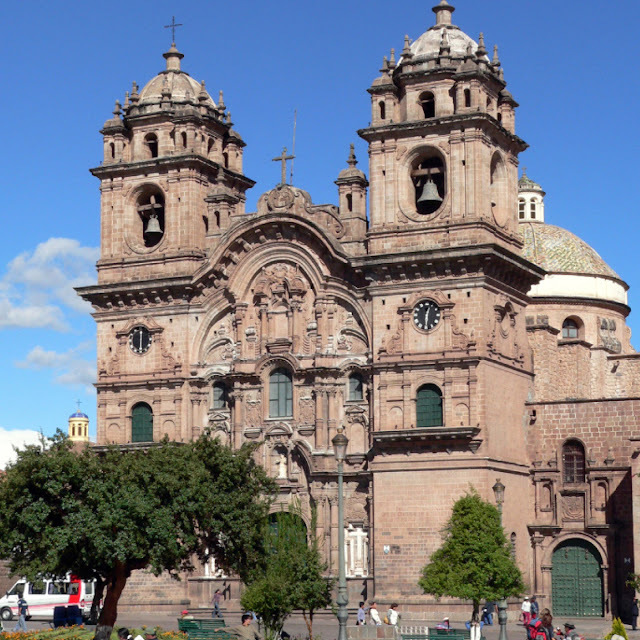 Day 2 – Fly to Cusco where Andean cultures come alive. Explore Incan stone terraces at Sacsayhuaman, the subterranean altars of Kenko, the water temple Tambo Machay, and the Puka Pukara fortress. Continue into snow-capped Andean peaks past Chinchero village to your oasis in the Sacred Valley. 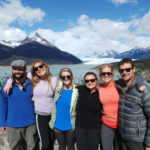 Day 3 – Visit the isolated Amaru indigenous community in the Andes. Gather plants used as natural dyes and see how the Amaru’s colorful textiles are brought to life. Lunch with community leaders or picnic amongst Pisac ruins before bargaining for wares in the region’s most vibrant market. Day 4 – Visit the massive Inca agricultural terraces of Moray and continue beyond the little-known village of Maras where pre-Columbian saltpans are still being harvested in the traditional way. 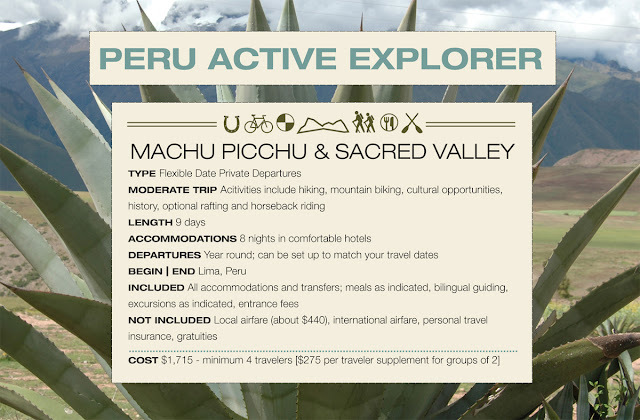 Take the train along the river and Inca Trail to your accommodations set amongst gardens, semi-natural pools, and hummingbirds at Machu Picchu Pueblo. 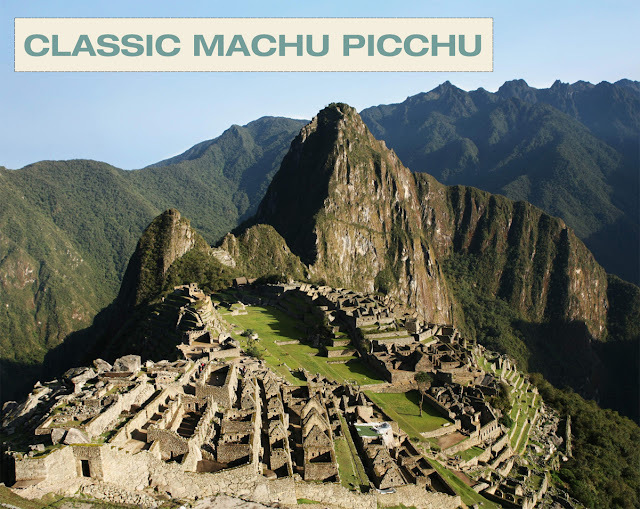 Day 5 – Revel at the sunrise from the Lost City of Machu Picchu, perched amidst Andean peaks and lush cloud forest. Enjoy a complete guided tour of the site as well as having time to explore on your own. Day 6 – A morning train ride takes you to Ollantaytambo where you can see the ruins towering above. Lunch at a colonial-era hacienda before continuing to Cusco. Day 7 – Enjoy the day at your leisure exploring Cusco – a city where traditional Andean cultures, the colonial Spanish, and modern Peru fuse into one. 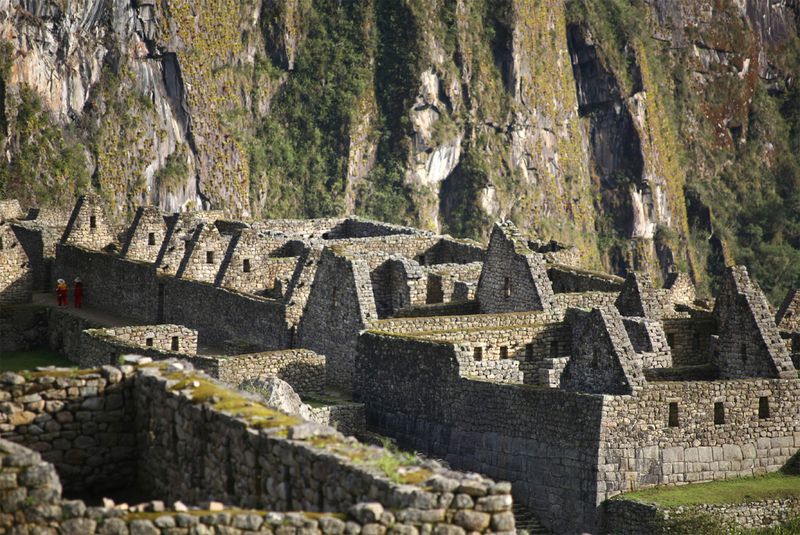 Visit Korikancha – Temple of the Sun, shop at Andean markets, enjoy savory Peruvian cuisine and see colonial cathedrals built atop Incan foundations. Day 8 – Return to Lima and depart. 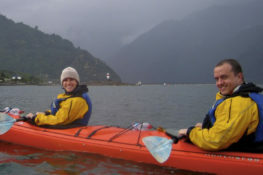 Or extend your trip with a visit to the Amazon or Lake Titicaca. Day 2 – Fly Cusco. Explore Incan stone terraces at Sacsayhuaman, subterranean altars of Kenko, water temple Tambo Machay, and Puka Pukara fortress. Continue into snow-capped Andean peaks past Chinchero village to your oasis in the Sacred Valley. 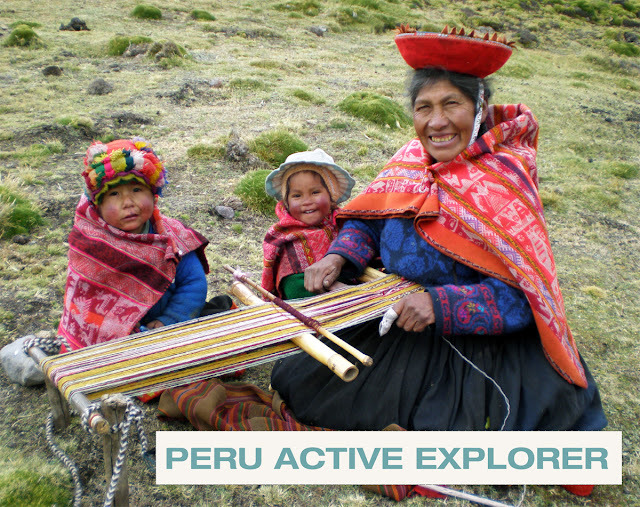 Day 3 – Visit the isolated Amaru indigenous community in the Andes. 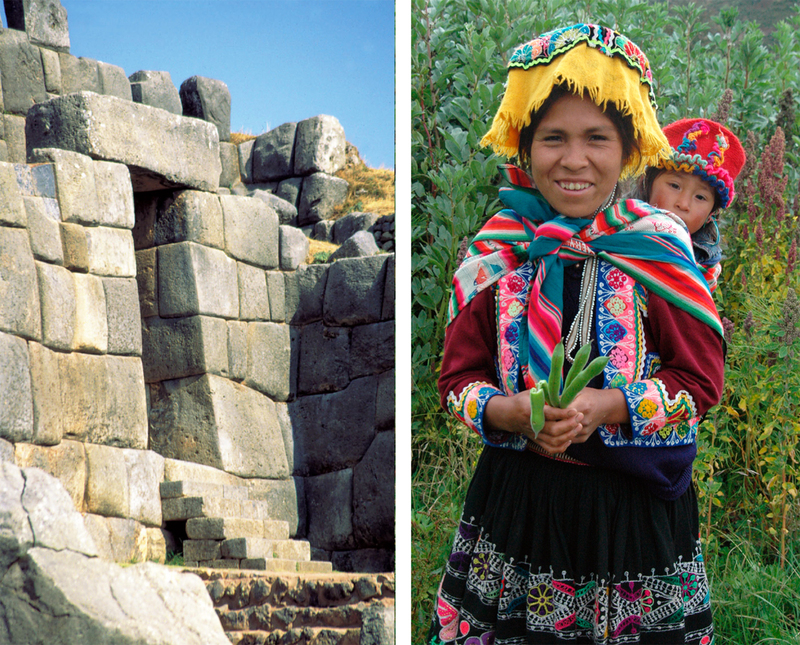 Gather plants used as natural dyes and see the Amaru’s colorful textiles brought to life. 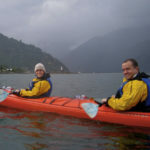 Lunch with community leaders – or picnic amongst Pisac ruins – and hike down the mountainside to the region’s most vibrant market and bargain for wares. 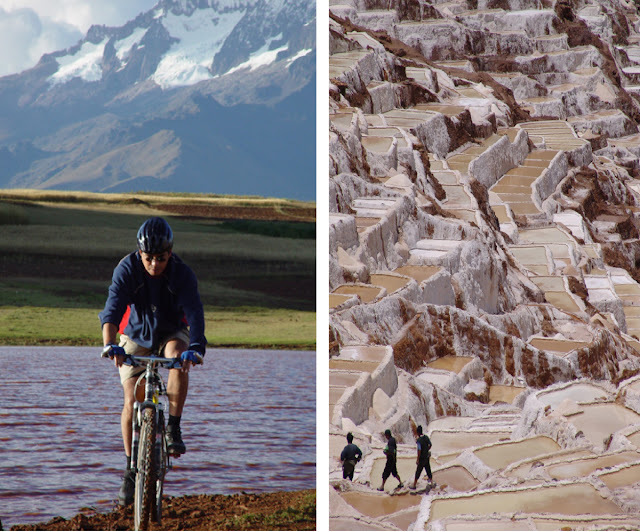 Day 4 – Mountain bike through colonial villages, down the Andes, to an ancient Incan laboratory, and amidst pre-Columbian terraced saltpans. 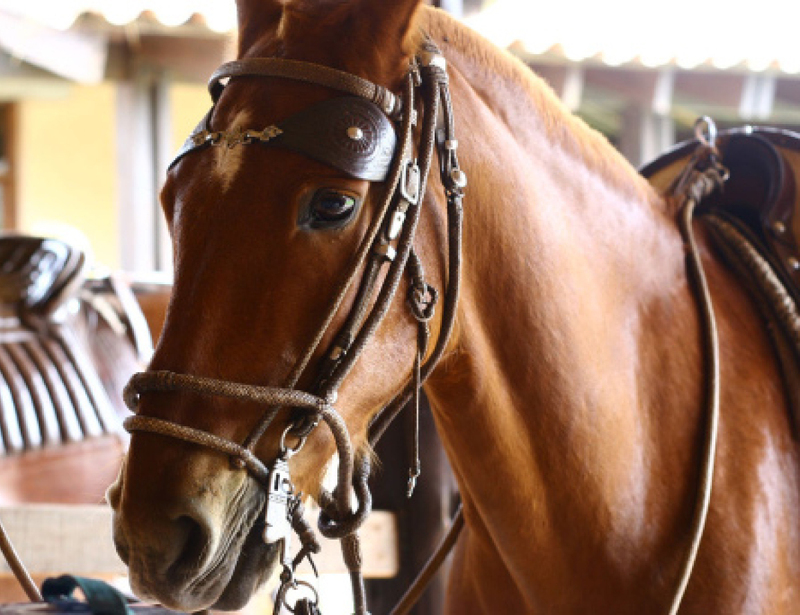 Good for experienced and beginner riders alike. Enjoy a gourmet picnic before continuing to the valley floor. Day 5 – Day hike the Inca Trail through Andean cloud forest on this ancient pathway leading you to the Sun Gate and the magical Lost City of Machu Picchu. Day 6 – Revel at the sunrise from Machu Picchu. Enjoy a complete guided tour of the site as well as having time to explore on your own. Also possible to summit Huayna Picchu for a bird’s-eye view. Day 7 – Hop the train to Ollantaytambo and see a vast ruin complex on the mountainside. Day 8 – Enjoy the day at your leisure exploring Cusco – a city where traditional Andean cultures, the colonial Spanish, and modern Peru fuse into one. Visit Korikancha – Temple of the Sun, shop at Andean markets, enjoy savory Peruvian cuisine and see colonial cathedrals built atop Incan foundations. Day 9 – Return to Lima and depart. 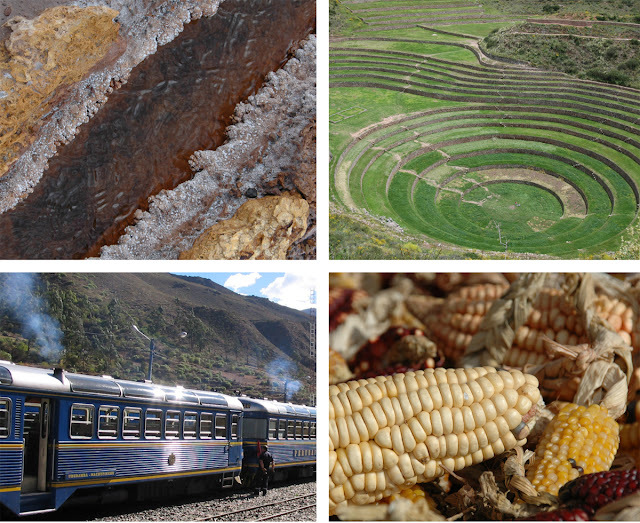 Or extend your trip with a visit to the Amazon or Lake Titicaca.